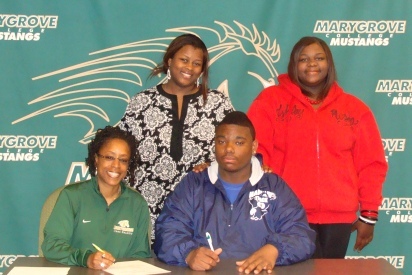 DETROIT, Mich.-The Mustangs added their first thrower in the program with the signing of Flint Hamady High School’s Derrick Jones II. Jones, a 5’11” strong thrower, excelled in discus, shotput, and the 400 for the Flint Hamady Hawks. The thrower took his strength to the lanes as a member of the Hawks bowling team for two years. When he was not on the lanes or tossing at meets Jones could be found volunteering his time for his beloved school. The likeable student-athlete was voted Homecoming Prince in 2007, is an active Student Council member, and plays in the school band. Jones found a way to participate while not being seen as well. Since 2007, Jones has been parading around as the Hawks’ mascot at all high school home games and pep rallies. Coach Womack on Jones II: Derrick is a solid student-athlete with great potential. He has tremendous upside that should be tapped into as a Mustang. We are very excited to have him as a part of the Mustang family.